This DVD contains two rare, highly collectable sixties films on the subject of Offshore Radio. 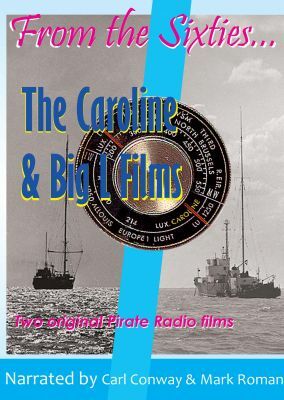 Firstly, the Radio Caroline film made by Paul Kramer in the Caroline Office in Chesterfield Gardens and on board the 'm.v. Mi Amigo' in 1965. You will see the faces of Alan Crawford, Brian Vaughan, Carl Conway, Don Allen, Keith Skues and many more Caroline personalities in this black and white film, narrated by Carl Conway. Secondly, we see the Big 'L' film made in 1967 it shows Deejay Mark Roman, Ian Damon, Pete Drummond, Paul Kaye, John Peel, Willy Walker and Tony Brandon in action on board the 'm.v. Galaxy' and Radio London studios in this colour film. Narrated by Mark Roman.